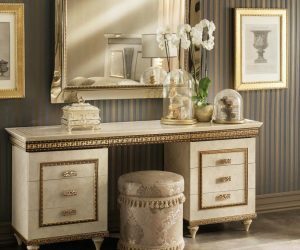 Italian classic furniture pulsates with an ancient vitality that captures and renews the styles that made the art and architecture of the ancient Greeks and then the ancient Romans. It is a style that strives for symmetry to create elegant and refined solutions, in which the apparent coldness of the space is countered by a surprising familiarity and feeling of comfort. Veritable interior design evergreens, frequently revamped in a modern style with a series of qualities that make it appealing, paying justice to its timeless beauty. A canon that meets the criteria of equilibrium, harmony and proportion, and as they taught us at school, an aesthetic that can still surprise the human eye. From the Parthenon in Athens to the Flavio Amphitheater in Rome (better known as the Colosseum), and from the Roman churches of the medieval age to the facade of the Santa Maria Novella in Florence created by Leon Battista Alberti, all the way to the neoclassical villas of Palladio. Undoubtedly, we have skipped a few historical steps and we have only proposed architectonic creations, yet it is clear: the classic style that we now mainly adopt in interior design is a look that is still fascinating. A look that has crossed history in a renewed fashion whilst remaining loyal to its canons. Classic design, elegance and certified Italian produced quality. Arredoclassic renews and re-proposes the classic look withing its furnishing collections for bedrooms, drawing and living rooms. A range of collections designed to meet every taste, in which essential and refined lines unite with precious and high-impact details, creating a luxurious and prestigious space. 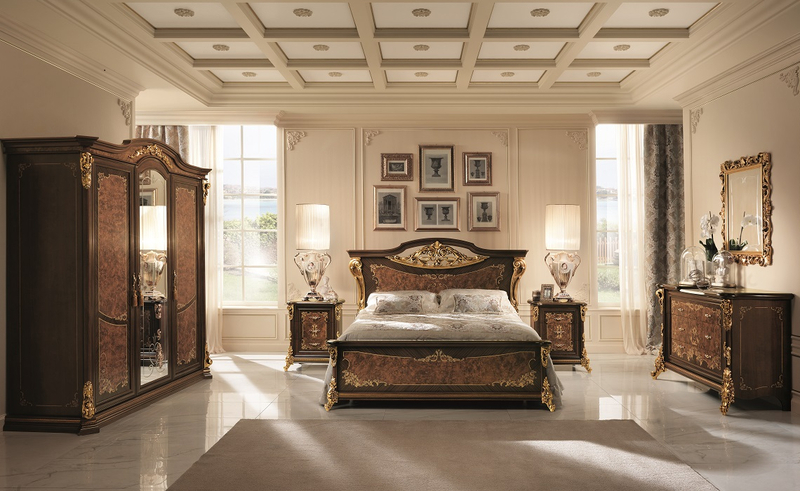 Italian classic furniture is that which is most at the heart of: innovative yet connected with tradition, profoundly Italian in terms of production and design, attentive to detail and the quality of the product. 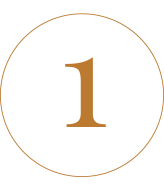 The spaces for which the collections are designed always vary, ideas and knowledge of the best raw materials to meet the always demanding needs of those seeking a luxury classic solution for their interiors are never short in coming. The Italian pride of Arredoclassic is certified “100% Made in Italy” by the Institute for the Protection of Italian Products, assigned after strict controls of the entire production cycle that has confirmed the highest quality of our products. 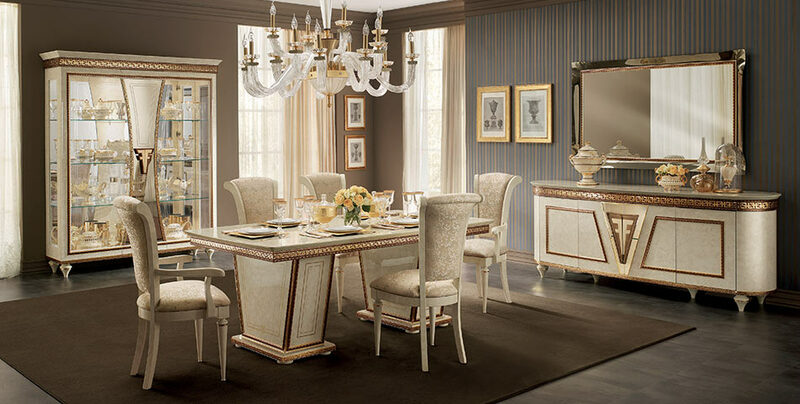 Why select classic furniture by Arredoclassic? 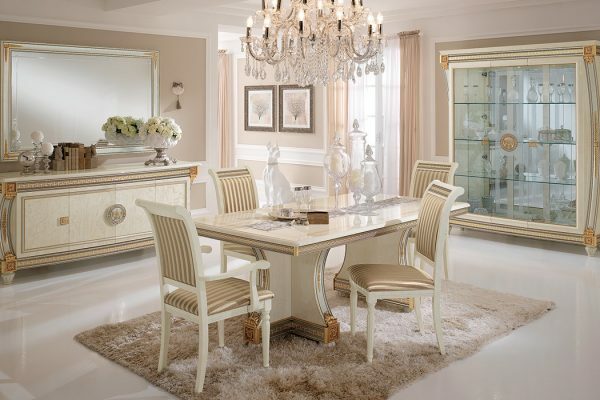 Selecting classic furniture for your interiors means selecting harmonic and balanced beauty, in which you seem to breathe the same noble and refined air that once pervaded the ancient villas of aristocratic families. 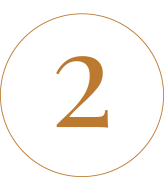 It means selecting furniture and furnishings made with prized materials such as oak, mahogany, cherry or beech, ceramic, bronze and marble. Furnishing you home in a classic style means loving neutral tones to highlight those prized and noble materials listed above. It means adding extremely refined and delicate accessories and decorations, creating a luxurious and precious feel without disregarding a comfortable and essential vision of space. When one speaks of Italian classic design or otherwise, reference is often made to columns and half columns, firezes and statues, cornices and rose windows. These features are not in themselves the style but they can certainly enrich it, even with a more modern twist, if used in the right manner. Marbles finishes, recalling the most noble of materials, combine perfectly with furniture made from the most prized wood, bestowing a pleasant and emotional feel to space, in which refined stucco and gilded elements are displayed to their best. Beds and night tables, dressers and sofas, tables and counter furniture, toilettes and chaise lounges offer structural lines and curves that can offer contrast without creating disharmony, creating the feel of being at ease in an elegant and apparently reserved context. Finishes and decorative elements are the cherry on the cake for your interiors in a classic style. 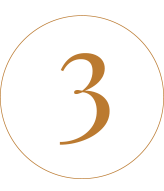 They are a type of enhancing corollary for the furnishing, that can embellish the lines and make a room stand out, be it the bathroom or the dining room: stucco and gold are excellent examples. When you are about to move or restore your home you start to think about interior design as well as the structural work for which you would enlist the help of professionals. Your mind starts to generate idea after ideas, some more beautiful than others, innovative and more traditional approaches, without any clear direction. Once you have an untouched space to work with (whether the house is new or old) you must start to design, plan and follow a stylistic idea that does not veer away from the defined track. The selection of Italian classic furnishing is based on a vision and planning that is highly demanding given the very nature of the style that demands an elegant, essential and highly balanced result in every macro and micro aspect. A complete project includes planning of the arrangement of furniture, the selection of a colour palette, evaluation of the best solutions to decorate different spaces and the careful insertion of accessories. Without neglecting another essential aspect that is often forgotten: lighting. The first step is to decide where to insert the furniture, or rather those elements that define the functionality of the room itself (a sofa in a bathroom is not what you’re after!). Apart from the various spaces it is important to take into account certain non-transitory and structural aspects. You should ask yourself certain questions about the space, functionality and stylistic equilibrium, so that you can really create an elegant and harmonious feel. Keep in mind that Italian classic furnishing demands simplicity and proportion, with a management of space that is extremely prudent. If this is not the case it becomes a disorganised and completely inelegant mishmash. Imagining and analysing the various and possible solutions for arrangement, thinking about the functionality of each piece of furnishing in keeping with the premise that every element has a reason for existing. Being fully aware of the interior space to define most effectively the various zones: in the kitchen, you should subdivide the area for preparation and that for eating, in the living room you should think about the relaxation area with sofa and that dedicated to work/reading inclusive of the desk/bookshelf. Selecting the colour palette is an integral part of furnishing your home. When you select a classic look you must immediately ask yourself: what tones in what schemes are best suited to a style based on simplicity, equilibrium and harmony? Colour is a highly distinctive element in every part of your life. For interior design it is a real macro-structure. The classic look is an evergreen that has always been able to renew and update itself without disregarding its founding principles: colour is important but only to offer accents within an atmosphere that is largely neutral and tenuous. So no to colour schemes that tend to create contrasts, such as complementary tones. It is best to focus on single tones or the union of analogous tones, thus creating a space that highlights structural lines and the precious quality of materials, decor and finishes. Keeping this in mind, the neutral colours par excellence (such as white and grey) obviously represent the ultimate for the Italian classic design of Arredoclassic. The Melodia bedroom collection, with its soft curves and particularly its delicate ivory colour, enriched by friezes with gilded details, offers a slight accent of green in the pillows that whilst standing out also supports the welcoming and relaxing feel. Having established the foundations, the time comes to think about the less structural but equally important elements. Light, for example, should be evaluated starting with the natural light offered by every room. 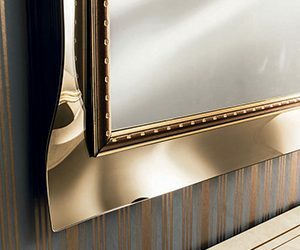 It can be implemented and enhanced through mirrors or showcases, or through metallic finishes. The less illuminated areas show you where to position artificial light (free standing, ceiling or wall) to supplement or highlight certain areas. Wallpaper can be an added and less obvious extra than paintings, mirrors or wall panels. This decorative element has recently come back into favour. Its versatility (its themes/patterns and the option is using only a sheet) can add that extra distinctive touch that is always elegant and refined, as the interiors of Italian classic design should be. 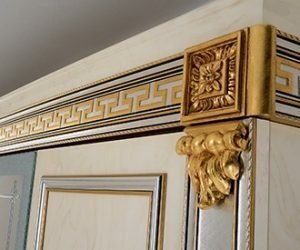 In all our collections gold is carefully used to embellish the line and details of our furniture, reinforcing the feeling of luxury and richness, without surpassing the classic principles. In Liberty for example it creates a spiral squared motif that echoes the other elements and so generates harmony. The same feel can be created on the moulding and the architraves to bring a greater feeling of unity to the entire room. The art of decoration is the realm of fantasy: it focuses on accessories, colour accent and details. It is conveyed through the decorative stucco that embellish the walls, ceilings and false ceilings, generating a feeling of ancient beauty that has remained elegant up to our times.